Thank you all so much for your caring words concerning my last post about the school shooting. It continues to lead the news here in the Madison/Huntsville area as you could imagine. Yesterday, I learned that my best friend knows the family of the shooter because she had his little sister in her 3 year old pre-school class last year. His name has not been released to the public since he is a minor, it will be decided in a couple of weeks if he will be charged as an adult. This morning the paper revealed that 3 or 4 people had received organ donations from the victim which gives the family some comfort. We continue to keep everyone in our prayers. This past Saturday was the opening of the art exhibit at Mill Villa Gallery from 12-6. 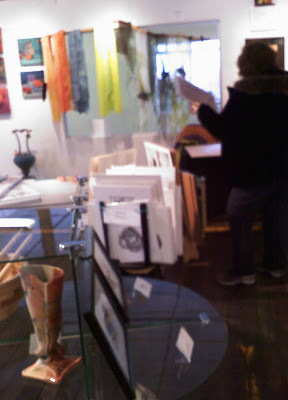 I spent a few hours hanging out there along with the owners and 3 or 4 of the other artists. Mr. Unplugged, BigBoy and VolleyGirl made there way up there for awhile, as did one of my nieces, my sister-in-law and her family and a friend and her husband. The two ink pieces shown above was sold! 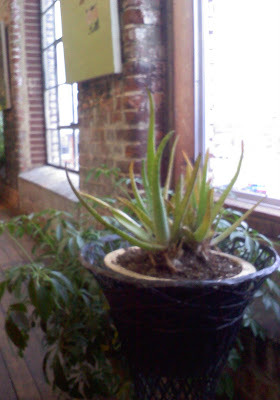 I immediately thought of Teri and the cactus gang when I spotted the cactus pictured above in the area outside of the gallery....that pic is for you!!! 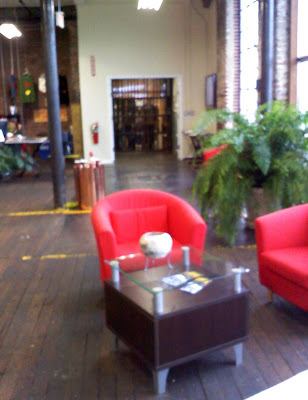 This is some of the seating area outside the gallery. In the background you can see the old elevator that brings you to the 3rd floor of the building where the gallery and 27 artist studios are. The gallery doors are to the left of this area shown in the photo above. Outside the double doors looking in the gallery. One of the owners is seated to the left, the man, standing to the left in the back is one of the artists. He and his wife's work was displayed just to the left of mine. There is my work, right in the middle of the photo, about a third of the way down from the top of the photo...see the green pear and red apple, with the larger landscape below them....that's me! Duh...here's a close up of my section. The artist with the work just to the left of mine was set up working, see, just to the right in the photo. Her husband was in the previous photo. He is from England, she used to work at the same company I did, a lifetime ago, she was in the England office, they were awesome! She worked in pastels, he in pen and in oils. He was a trained cartographer and did some map type art that was amazing. This photo is just to the left of their work, there were scarves and other items too. 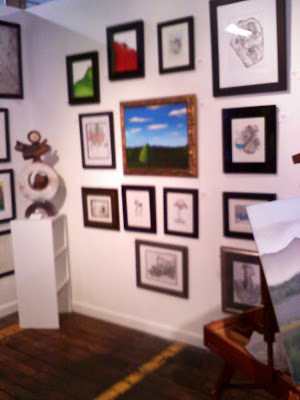 Two of my color pencil drawings are in the black frames in the front of the photo. 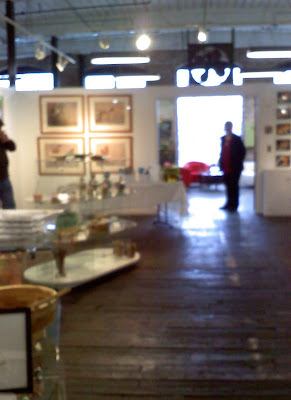 The photo above is from the back of the gallery towards the front doors. 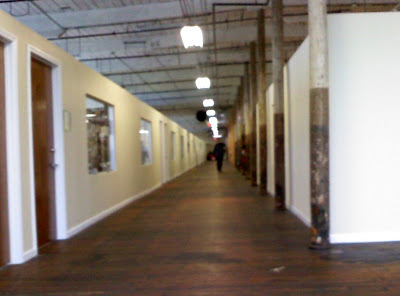 The Lowe Mill Arts & Entertainment Center is the location of the gallery, which is on the 3rd floor. Orginally it was a textile mill back in the early 1900's and the wood floors are old and awesome, you can still see paint lines or markings from where equipment once was. The walls are the old brick. Stairs are available but the old elevator is used, must press the button that rings a bell to get the operator to come pick you up! There is a little restaurant and bread place on the first floor. In the near future more artist studios will be built on the first floor and you can already get on a waiting list but I like the 3rd and am going to get on that list. BigBoy was impressed, better than he thought, and was open to utilizing any space I might get in the future! 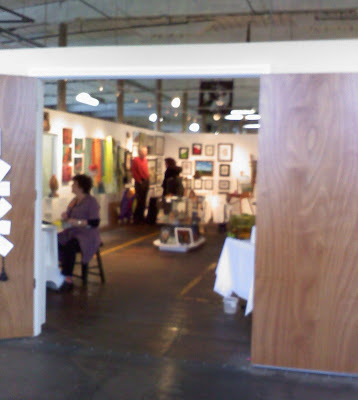 The second floor hosts different events and has most Saturdays where anyone can come and set up there art, wares, etc. You will see a wide variety of items. The 3rd floor is the recent opening of the building, less than a year. Many people have not been up there. Okay, bored you enough? Almost finished with another fruit painting. They have one or two extras to replace my work at the gallery but that's all I have! Must have items ready in case something sells, responsible for providing art within 5 days of notification. 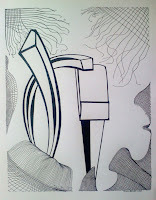 I have also contacted another place here about exhibiting in the near future. I worked yesterday from 9-2:30 and that does it for the week. Until they get some more of their clients, it is hard to get all the auditors many hours. That is fine with me and Mr. U right now cause I am working on the art and he is in the throes of a job change, after 23 years, he resigned and will be starting a new job. Something he has been planning for a very long time, every i is dotted and t crossed with careful attention, so this has been whirling around here intensely the last couple of days, weeks and on for months. The company has changed over the years, he is now one of the employees from "old school" and this is a great change for him. I need to be available for majestic duties on demand for one thing. Bored yet? Relax. I'm finished for now. Will wash, grocery, paint, cook, catch up on your sites the rest of the day! Have a great Tuesday! Congrats on the sale of those two Zens of yours. wow. Sounds like things are progressing on Mr U's new job. Maybe things will settle down once he is into his new job. oh Word veri is notfuni. Golly! I think this may be the longest post you've ever done! I loved it, though. I love seeing the gallery; any gallery. And your art looks so right at home there. I'm sure your work will sell like hotcakes. How exciting about your hubby's job change. That must be a really rewarding feeling. sorry i haven't been around lately. hugs to you and apollo. Congrats AU! So impressed to see your work hanging in a gallery!! Good for you!